Treasury Secretary Tim Geithner failed Tuesday to persuade Wall Street that he will succeed where his predecessor Henry Paulson failed. Geithner outlined the administration's plan to restart frozen credit markets and bolster the health of troubled banks. He said the economy will recover from its swoon only with the help of healthy financial institutions. But observers said the Obama administration's plan is neither well-funded enough to recapitalize troubled banks, nor detailed enough to assure investors that the government can solve the toxic asset problem plaguing banks. Suze's back, and taking your questions! Program Note: Suze Orman's on AC360° to discuss how to keep your money safe. Suze will be back on AC360° on Wednesday night to answer your economic questions? Do you have questions about the continued economic trouble and how President Obama's economic plan will change the market; affect your stocks, mutual funds, 401(k)… your job? 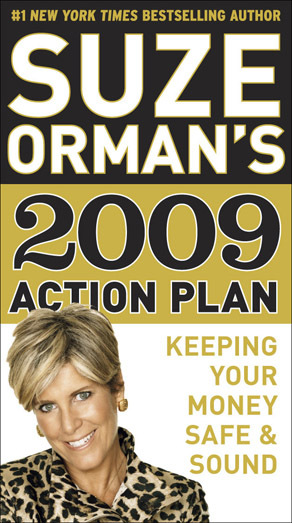 Suze's book, " Suze Orman's 2009 Action Plan," is currently number one on the New York Times bestseller list and she answers these questions, and many more! Submit your financial questions here for Suze Orman and watch AC360° to get them answered. 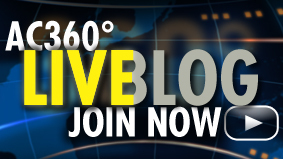 Want to share your thoughts on the stories we're covering tonight? You're in the right location. Just scroll down and post your comments. This is where you can "chat" with Anderson during the program. Keep in mind, you have a better chance of having your comment get past our moderators if you follow our rules. We're so tech savvy here at AC360°. At least, we like to think we are these days. So, we've got more goodies for you. GOP Sens. 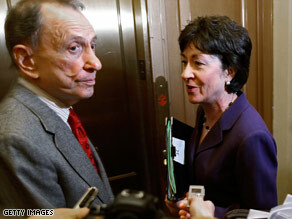 Arlen Specter and Susan Collins say the final bill won't have their support if it is drastically different. It's a busy night on Capitol Hill. 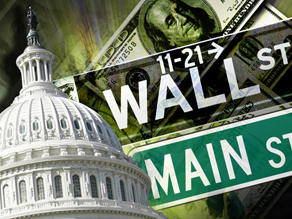 Just hours after the Senate approved its own economic stimulus plan, now comes the hard part. Negotiations are underway to somehow cut out major difference in the Senate and House bills and come up with a new one that will get approved by both chambers by this weekend. This won't be easy. We're talking about different price tags, different priorities. The House tally is $819 billion. The Senate version costs $838 billion and provides more tax cuts. Tonight we'll have the latest on the talks and break down the differences that need to be worked out. Three GOP senators broke party lines to vote for the Senate plan – Sens. Susan Collins, Olympia Snowe and Arlen Specter. They warn if there are drastic changes to the bill they may not support the final version. Meanwhile, Treasury Secretary Tim Geithner has unveiled the administration's latest plan to help America's banks. He's says those with assets of $100 billion or more will face a "stress test" to see if they can survive long-term economic hardship. He also said the government would direct more than $1 trill in public and private cash to help boost banks. But investors were not impressed. The Dow fell 381. The S&P shed 43 points and the Nasdaq lost 67. Do you think these plans will help boost the economy? We'll have these stories and more starting at 10pm ET. Editor’s Note: You can read more Jami Floyd blogs on "In Session"
Since the economic downturn began, the media has been reporting a “rash” of cases in which men who have lost jobs or money have killed themselves and their families. 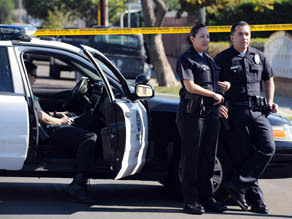 In the most celebrated case Ervin Lupoe killed himself, his wife, 8-year-old daughter, 5-year-old twin girls and 2-year-old twin boys in Wilmington, California. He and his wife had both lost their jobs. It is easy to focus, in these cases, on the financially stressed father who snapped. But it is not really the economy that is to blame. It is true that some men who lose their jobs or life savings are vulnerable to depression and can become hopeless or even psychotic. It is true that suicide, spousal abuse and child abuse increase slightly in bad times. Ready for today's Beat 360°? Everyday we post a picture – and you provide the caption and our staff will join in too. Tune in tonight at 10pm to see if you are our favorite! 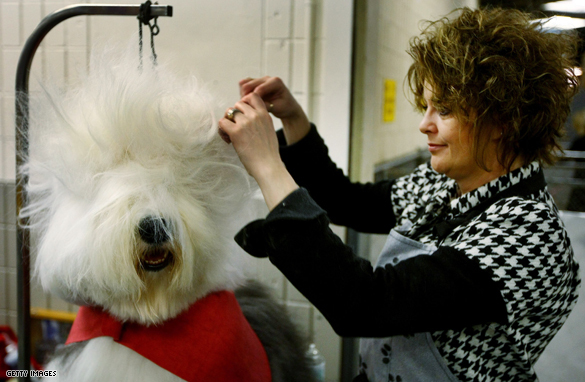 Shannon Scheer grooms her Old English Sheepdog ' Iggy' backstage during the 133rd Annual Westminster Kennel Club Dog Show at Madison Square Garden February 9, 2009 in New York City. Have fun with it. We're looking forward to your captions! UPDATE: Check out our Beat 360° Winners! When you win ‘Beat 360°’ not only do you get on-air prime-time name recognition (complete with bragging rights over all your friends, family, and jealous competitors), but you get a “I Won the Beat 360° Challenge” T-shirt! As fires smoldered and sometimes raged across sections of the scarred landscape Tuesday, rescue officials in Victoria attempted to offer solace to hundreds burned out of their homes and frustrated at being unable to return. Tent cities sprung up around Whittlesea, just north of Melbourne, as relief agencies pitched camps for those forced out of their homes. 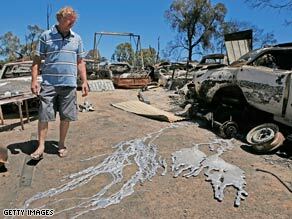 Weekend bushfires "completely wiped out" the towns of Marysville and Kinglake, officials said. More than 20 fires were burning Tuesday, according to the Country Fire Authority. Frustration also brewed as residents desperately wanted to return to their homes, or what was left of them, but were prevented by authorities because of safety concerns. The toll from Saturday's inferno has grown day by day. Police in the state of Victoria put the number of deaths from the fires at 181 on Tuesday. Pres. 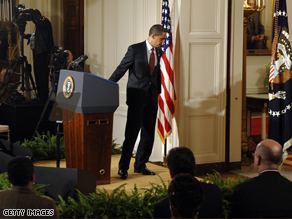 Obama steps away from the podium after his press conference on his economic stimulus plan. Now that President Obama has warned over and over that this economic crisis could turn into a “catastrophe” if Congress doesn’t act quickly on a stimulus package, I'm trying to get an image in my head of what “catastrophe” means. Some Republican opponents of the stimulus plan say they’re more worried about a different kind of flood – a flood of taxpayer dollars being spent in ways that are not guaranteed to work – a flood of debt passed down to our children. That’s a legitimate fear that must be addressed. But there’s no questioning the flood we face right now. 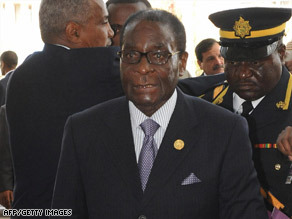 It is the 85th birthday of President Mugabe this month and the zealots of his Zanu (PF) party are determined that it should be an occasion that their great leader will never forget. In recent days they have been out soliciting “donations” from corporate Zimbabwe and have drawn up a wish list that is scarcely credible in a land where seven million citizens survive on international food aid, 94 per cent are jobless and cholera rampages through a population debilitated by hunger. The list includes 2,000 bottles of champagne (Moët & Chandon or ’61 Bollinger preferred); 8,000 lobsters; 100kg of prawns; 4,000 portions of caviar; 8,000 boxes of Ferrero Rocher chocolates; 3,000 ducks; and much else besides. A postscript adds: “No mealie meal” — the ground corn staple on which the vast majority of Zimbabweans survived until the country’s collapse rendered even that a luxury.